Cox Farms Market and other tenants could open as soon as fall of 2013, according to an announcement from Sylvan| Thirty. The project’s developer put up fences around the site this past weekend. And the city is expected to issue a building permit around the middle of January. “After that, we can start cleaning and preparing the site for construction,” the announcement states. We expect to hand the keys to the grocery store space over to our grocery tenant, Cox Farms Market, in Summer 2013. 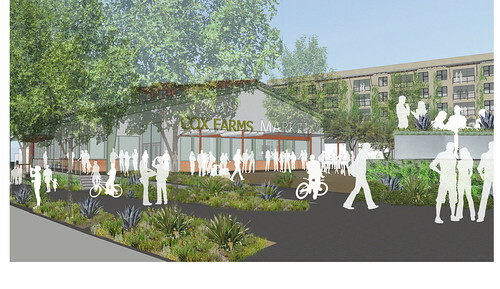 Cox Farms Market and other tenants should begin to open for business in Fall 2013. The studio apartments should be available for move-in at the beginning of 2014. Construction originally was supposed to start this past May, but permitting apparently was delayed by bureaucratic hangups. Check out the project’s most current renderings here. Not sure, Jonathan. I will ask them. Did they ever relent to the city’s bicycle infrastructure design for Sylvan north bound between Ft. Worth Ave and I-30? They were against separated bicycle lanes, and only shared lanes as I understood it.